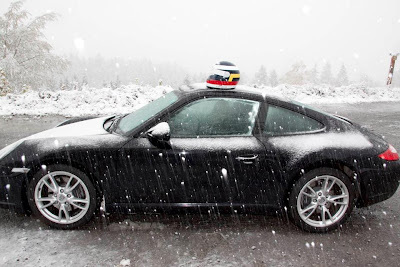 One Hot Lap: First Snow Reported at a Racetrack for the Season! First Snow Reported at a Racetrack for the Season! Hat Tip to Roland R.
This is a picture from the Nurburgring from earlier today. It coincided with the freak snow storm we got for our last event in the Boston area exactly a year ago: October 27: Not a Good Day for R-comps! What were the odds of this happening, Sandy? ?